Today begins the final push before the Christmas holidays. This week we have Diva's school Christmas program and a fundraiser to attend on top of participating in our church's annual Walk to Bethlehem live nativity with a few Christmas parties sprinkled in for good measure. Menu planning really comes into its own on weeks like this. By the way, the recipes that I had links for last week were really good and worth checking out. Even Engineer went back for seconds of the Sweet Potato Chili! 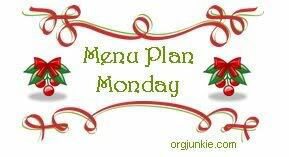 This is part of Organizing Junkie's wonderful extravaganza Menu Plan Monday.